I like candles as a centerpiece at the dinner table. This is as true for Tuesday nights as it for feasts or special occasions. I especially like those candles during the dark days of late fall and early winter. 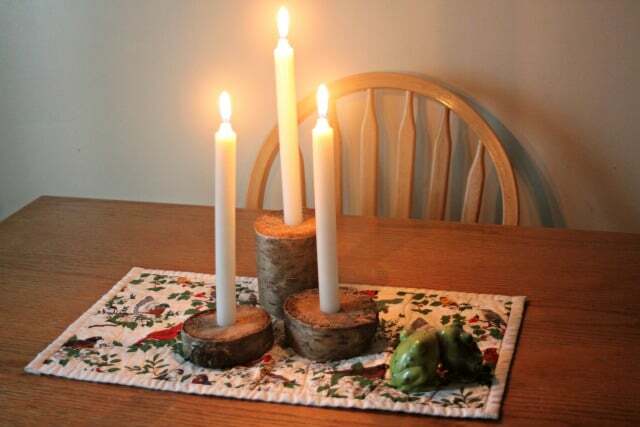 It doesn't have to be anything fancy and because I tend to want to bring nature indoors during those seasons as well, we made some rustic candle holders from logs for this season's centerpiece. This is an easy project for all skill levels. All it requires are some basic hand tools, a branch, and some candles. So go for a walk or easy hike and find the perfect branch for your candle holders. Branches at least 3” in Diameter : Use any branch of good size you find on a nature walk. There is no need to cut something from a tree. If it’s a little rustic, so much the better. The branch should not be so rotten or soft that a hole can’t be drilled into it but it doesn’t need to be green or super hard either. Drill with ⅞” Spade Drill Bit : The size of drill bit will vary based on the size of the candle. Most tapers or round stick will work just fine with the ⅞” bit but you may need to go a bit larger or smaller depending on your candles. Using the saw slice the branch into desired widths for candle holders. Do several at 1 inch slices or do a variety of widths, a 1-inch, a 2-inch, and a 3-inch. Keep one edge of the slice flat. This would be the bottom of the holder that sits on the table. If desired, slice the top edge of a thick slice at an angle for a pretty effect. In the center of the slice, drill a hole with the spade bit. The hole should be at least ½” into the wood. Place the candles into the hole and light for dinner or any other occasion. These could easily make a lovely hostess gift or even a wedding gift. 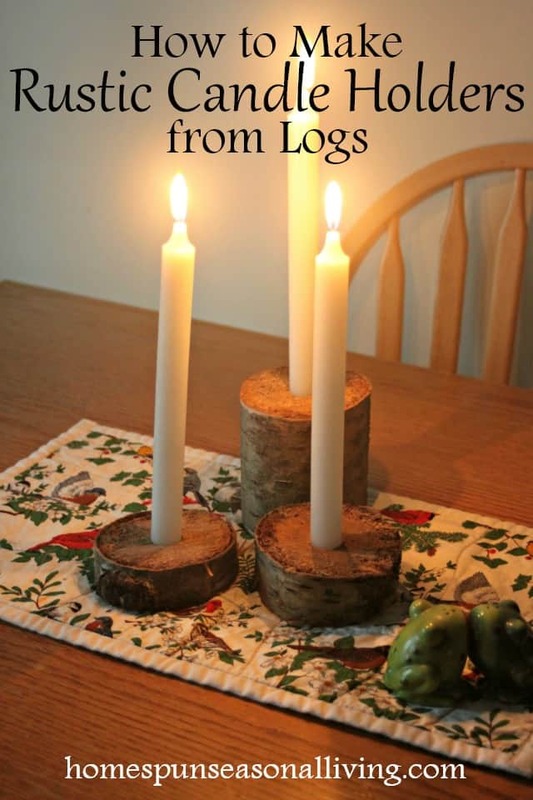 Find beautiful or interesting logs to make the candle holders. Pair them with some homemade beeswax tapers and wrap for a simple, natural gift to grace the table of loved ones. It's really that simple. And it's really that elegant. I get more compliments on these candle holders than any other I've owned or made over the years. They're simple to be sure but it is their natural simplicity that folks are drawn too. They fulfill their purpose while also helping us connect to the natural world outside. This connection seems even more important during the seasons when we spend more time inside than out. I love these! Thanks so much for sharing.